Consumers have become accustomed to purchasing and receiving products on demand. Retailers are finding it increasingly difficult to justify large-scale inventories sitting in warehouses. Having inventory in more places, but in lower quantities allows for faster servicing of changing retailer requirements. Rapidly evolving consumer trends are forcing a reshaping of inventory management operations. Physical stores are being incrementally supplemented by online shopping and home delivery services, and consumer packaged goods (CPG) and retail operators are changing quickly in order to satisfy the new demands that come along with the new consumption realities. Consumers have quickly become accustomed to purchasing and receiving products on demand, with near-immediate fulfillment. As a result, retailers are required to facilitate faster turnaround, and are finding it increasingly difficult to justify large-scale inventories sitting in warehouses. While the positive impacts of these new realities are clear – greater product availability, simplification of convenient purchasing – the impacts on transportation spend has been, for many, rapidly outpacing those sales opportunities. Even before last-mile delivery challenges develop, new transportation strategies are needed. Stores are requiring smaller quantity shipments, but more frequent delivery, and CPG companies are on the hunt for cost-effective ways to optimize the new pace of product fulfillment. Working on the front line with our CPG and retail customers, here are some of the different approaches my company has seen instituted that help to effectively mitigate cost increases. Network Redesign. With more shipments going out, but with fewer goods, some businesses are redesigning their distribution setups. While it may have been profitable to send a fully loaded truck 1,000 miles once per month before, it doesn’t make sense to send two partially loaded trucks that same distance multiple times in the same time period. By leveraging data analytics and geographic pricing trends, we are reevaluating warehouse selection, product mix, and inventory density. For some, warehouses are shrinking in size but increasing in number. Having inventory in more places, but in lower quantities allows for faster and cheaper servicing of changing retailer requirements. Multi-stop Shipments. Other shippers are solving the problem with a multi-stop approach. Able to consolidate regional freight into one full truckload, they coordinate multiple drop offs and are able to avoid LTL complications. This is a strong approach for companies that don’t have a large warehouse network or who are moving product directly from the production line to customers. But putting together a best-in-class multi-stop program can be extremely challenging and requires a true specialist and partner that understands your customer well enough to create optimized routing that brings costs under control without causing service deficiencies. Pool Distribution. Another option is to leverage FTL or railroad for long-hauls, then break up orders at a central location where LTL shipments make more sense. There are service providers that specialize in this solution, and can help with actual repacking of large shipments into smaller orders. This approach most benefits those who work with multiple retailers that require widely differing pallet configurations. As the retail industry and consumer demands continue to change, shifts in transportation strategy will be constant. Working with a partner who can help navigate these changes is imperative. They can share best practices learned from work with other customers, provide access to essential technologies and a vast carrier network, and should consistently help you identify areas for enhanced efficiency. 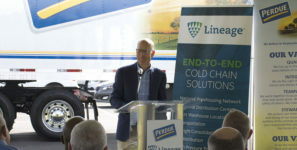 Andrew Lynch is co-founder and president of Zipline Logistics, an Ohio-based 3PL that specializes in providing multimodal transportation services and business intelligence for CPG and food and beverage customers.